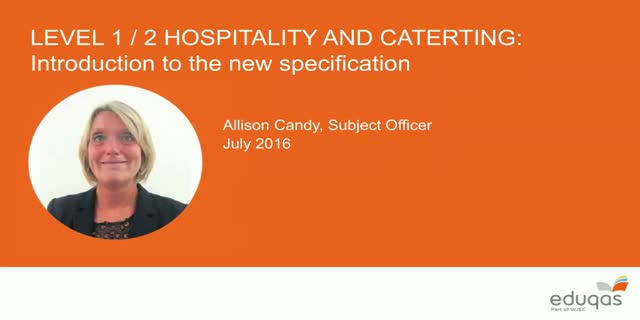 Subject Officer, Allison Candy will provide guidance and support on the delivery and assessment of the new Level 1/2 Hospitality and Catering qualification. This 90 minute, free online training will cover both the specification and sample assessment materials in depth. In attending this course, you will also be provided with the opportunity to participate in a Q&A session, with Subject Officer, Allison Candy, about the new specification. This 60 minute, FREE online webinar is designed for teachers within existing WJEC / Eduqas centres and those interested to learn more about the new specification. The webinar will help teachers gain an understating of the content, key changes and assessment requirement, including available teaching and learning resources. This 90 minute, FREE online webinar is designed for teachers within existing WJEC / Eduqas centres and those interested to learn more about the new specification. The webinar will help teachers gain an understating of the content, key changes and assessment requirement, including available teaching and learning resources. WJEC Eduqas Film Studies Subject Officer Rebecca Ellis, will provide guidance and support on the new GCSE (9-1) Film Studies qualification and its assessment structure. WJEC Eduqas Geology Subject Officer David Evans, will provide guidance and support on the new GCSE (9-1) Geology qualification and its assessment structure. There will also be an opportunity to participate in a Q&A session with the subject officer. WJEC Eduqas Geology Subject Officer David Evans, will provide guidance and support on the new AS/A level Geology qualifications and their assessment structure. This 90 minute, FREE online webinar is designed for teachers within existing WJEC / Eduqas centres and those interested to learn more about the new specifications. The webinar will help teachers gain an understating of the content, key changes and assessment requirement, including available teaching and learning resources. WJEC Eduqas Business Subject Officer Stephen Oliver, will provide guidance and support on the new GCSE (9-1) Business qualification and its assessment structure. Subject Officer, Catherine Webster and Subject Specialist, Wyn Jones will provide guidance and support on the delivery and assessment of the new GCSE (9-1) qualification. This 90 minute, free online training will cover both the specification and sample assessment materials in depth. In attending this course, you will also be provided with the opportunity to participate in a Q&A session, with Catherine Webster and Wyn Jones about the new specification. Subject Officer, Catherine Webster and Principal Examiner, Janice Richards will provide guidance and support on the delivery and assessment of the new GCSE (9-1) qualification. This 90 minute, free online training will cover both the specification and sample assessment materials. In attending this course, you will also be provided with the opportunity to participate in a Q&A session, with Catherine Webster and Janice Richards about the new specification. Subject Officer, Allison Candy will provide guidance and support on the delivery and assessment of the new GCSE (9-1) qualification. Eduqas is part of WJEC, offering Ofqual reformed qualifications to secondary schools and colleges. Our webinars, delivered by subject specialists, cover specification content and sample assessment materials in depth, ideas for teaching and information on available resources.